This listing is for ONE log mug planter. 1 Mini mug planter 2.5 inches tall and vary between 2-3 inches in diameter and a 1.5 oz cup to hold the plant. 1 Large mug planter 3.62 inches tall and vary between 3-3.75 inches in diameter and a 3 oz cup to hold the plant. Made from green cut White Oak tree branches. 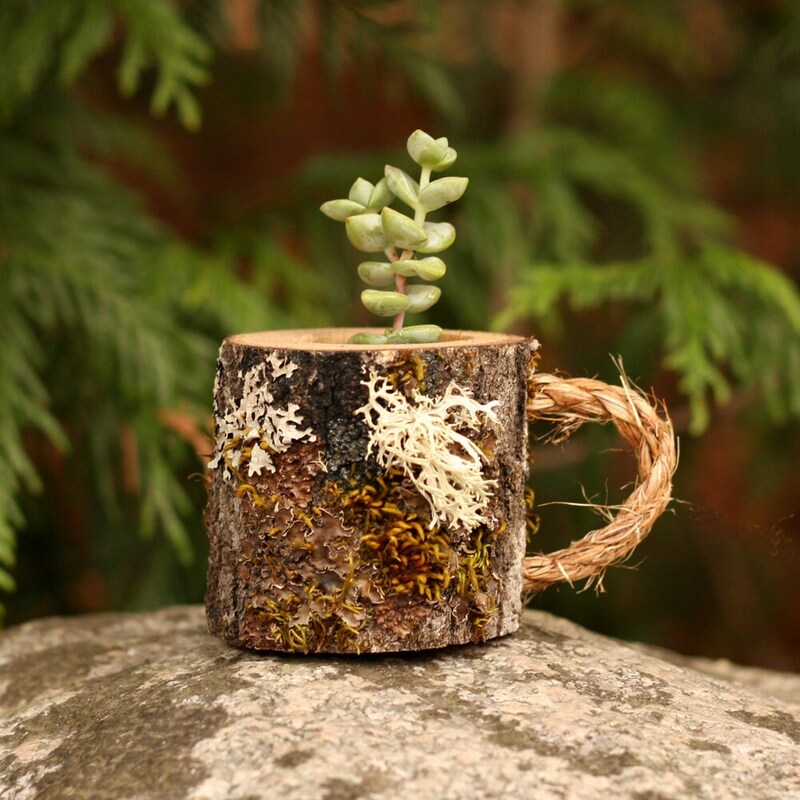 These unique mini / Large wood mugs make excellent succulent holders perfect for a home or desk decor, wedding centerpiece, gift or favor. Can also be used for table number holder or place card holder. By cutting our branches green and sealing the inside and ends of our items, we have minimized the cracking of the wood and loosening of the bark. If used as a planter, take care not to over water as there is no drain hole. These are designed for low water requirement plants such as succulents and air plants. Look at our other listings for larger quantity discounts. Convo us if you need a custom listing amount other than 3,12, or 24 and we will try to accommodate your needs. If there is something you want that you don't see in our shop, please let us know and we will see if we can make it for you! Super cute and arrived quickly. This item is absolutely precious! I haven't checked the size (so it's my fault) and it was a little small for me. Just make sure you are aware of this. Otherwise, this item is precious and I received it very quickly! It's a 100% Hit!! We accept all major credit and debit cards, PayPal and Etsy gift cards. If items are damaged during shipping, send us a photo of the damaged item within 3 days and we will send you a replacement. In order to save you money, we use the least expensive method of shipping available for our items. we use USPS first class and Priority mail.